The curtain rose at the War Memorial Opera House to reveal a black backdrop outfitted with a single strand white arc. Two couples costumed in solid-colored unitards entered stage right and began a short set of choreographic etudes. Beautiful, complete and brief, each excerpt was like a short conversation, full of intricate details – a flexed standing foot on the arabesque slides; a supported pirouette where the foot descended from passé to coupé. With this stark, clean and uncluttered statement from Hans van Manen’s “Variations for Two Couples” (2012), closing night of San Francisco Ballet’s third program (a quadruple bill) was underway. Up next was Williams Forsythe’s “The Vertiginous Thrill of Exactitude” (1996), an exciting pas de cinq danced by Julia Rowe, Sofiane Sylve, Vanessa Zahorian, Carlo Di Lanno and Gennadi Nedvigin. As the title suggests, “The Vertiginous Thrill of Exactitude” was all about dizzying precision: constant motion, abrupt directional changes, dramatic shifts of weight. And the cast delivered one hundred percent on this complex equation. From big en dedans/en dehors turning sequences to subtler meeting of the hands in partnering, everything was right on point. As the only corps member in this particular cast, Rowe deserves special mention. She is full of fresh energy and inspired technique and can handily hold her own amongst the company’s soloists and principals. San Francisco Ballet in Thatcher's "Manifesto"
played out in some lovely pas de trois moments between Jennifer Stahl, Sean Orza and Steven Morse. With his authentic joy, integrated stage presence and the technique to back it all up, Morse continues to distinguish himself at SFB. 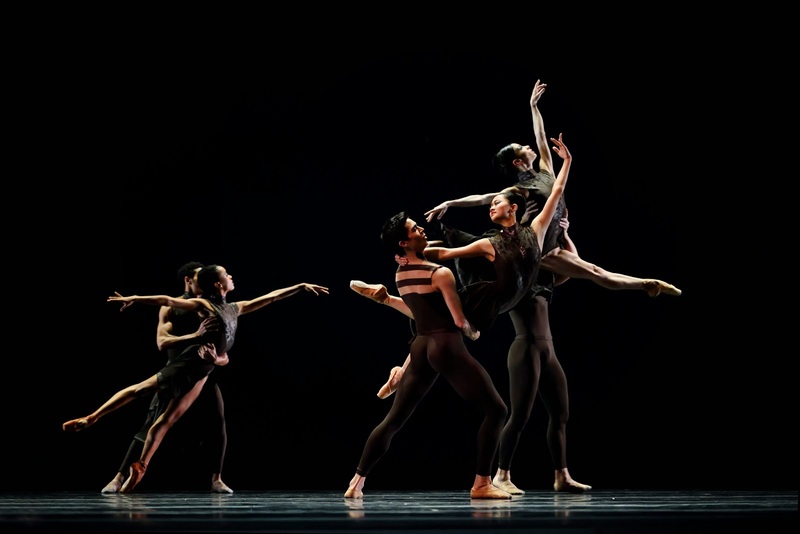 The middle section of the ballet expanded previously introduced material – adjusting it, pushing it beyond its limits and dismantling expectations. Hansuke Yamamoto and Dores André made the most sublime pair during this development chapter; their pas de deux stretching into one long legato phrase. The ensemble returned to the stage for the stunning finale of “Manifesto”, a picturesque tapestry of shapes, positions and diverse motion. Program three concluded with “The Kingdom of the Shades” scene from Act II of “La Bayadère”, choreographed and staged by Natalia Makarova (after Marius Petipa). With Maria Kochetkova and Joseph Walsh in the leading roles, everything was grand, classical and regal. Turning sequences from both (Kochetkova’s piqué posés and Walsh’s fouettés) wowed the audience; it was some of the best technical dancing of the night. After recovering from a couple of rough patches, the featured Shades variations also delighted. And the women’s corps de ballet outdid themselves with their attention to detail. In last season's third program, the extension heights varied quite a bit in this famous scene. But in program three 2015, all twenty-four women were in sync; working together as a team.